6 p.m., May 18, 1909. Somersworth, New Hampshire. 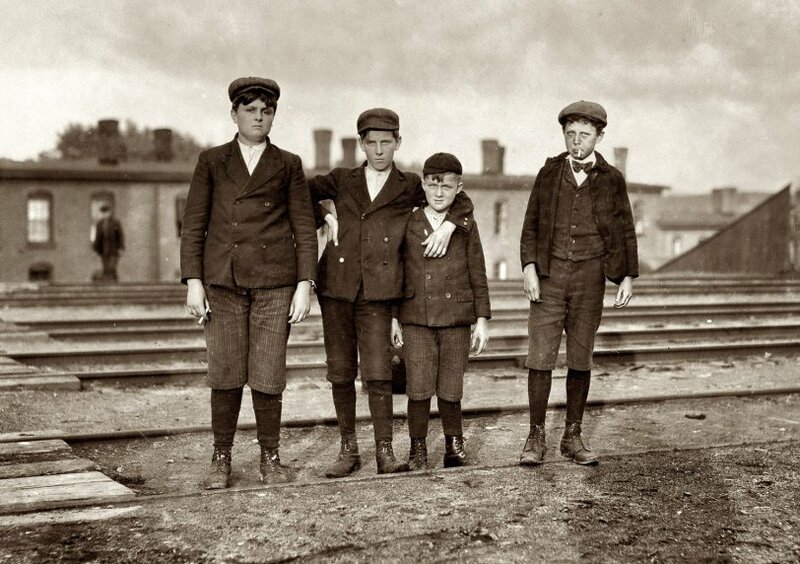 "Group of boys working in Great Falls Manufacturing Co. Smallest boy is Alfred Ouellet, 212 Main Street. Fat boy is Willie Laudry, 35 South St. Boy on right hand end is Napoleon St. Lawrence, 23 Union Street." View full size. Photo and caption by Lewis Wickes Hine. Submitted by chlyn on Thu, 11/05/2009 - 8:04pm. I bet Willie's last name was Landry, not Laudry. Landry is a common Acadian name (descendants of the French colony in the Canadian Maritimes). Many Acadians emigrated to New England during the late 1800s/early 1900s. Submitted by Anonymous Tipster on Sun, 06/22/2008 - 10:19am. It's as if they just stepped off a movie set. I wonder how these grim kids turned out - I hope they did well for themselves. Submitted by Brent on Fri, 06/20/2008 - 1:58pm. The three kids have French names - although in the case of Napoleon St. Lawrence it's probably been anglicized from the original St. Laurent - so I think it's fair to assume that their parents were among the French-Canadians who came to Maine New Hampshire and Vermont to work in the mills. They'd be called "Canucks" as an insult by their Yankee neighbours and employers, which is vaguely ironic since we Canadians don't find that word the least bit insulting. Submitted by Lance on Fri, 06/20/2008 - 9:15am. Okay, so it isn't about these actual kids, but it's so close. Check out "Once Upon A Time In America," made in 1984, I think, directed by Sergio Leone, starring Robert DeNiro and James Woods - but make sure you see the directors cut. In this form it is one of the best movies ever made. The shortened (totally butchered) version, often seen in early releases, is one of the worst. It kept the movie from receiving the accolades it deserved, until later DVD releases finally made this right. It is a gangster film, but totally different than the usual fare. The childhood flashback scenes, which take up a good part of the film, are heart-rending. and the photography is beautiful...every scene could be right out of the Shorpy archives. Submitted by Anonymouse on Fri, 06/20/2008 - 7:57am. Nothing on him? You'd think he was related to Alfred, considering how close they seem. He's also the only one without his cigs, assuming that's what's in Alfred's box. In a way, Hine is in the shot, too... his shadow's on the ground. Submitted by Anonymous Tipster on Fri, 06/20/2008 - 2:30am. Wow. They should make a movie about these kids, they have so much character.